This week brings an episode of Enterprise: Minefield (S2E3). TNG’s Timescape is up next on Random Trek. You know, the one were Picard draws a happy face on some coolant. Collective (VOY) is the topic of discussion for this week’s episode of Random Trek. Those kid Borgs, so precocious! We dive back into The Original Series this week with The Apple. 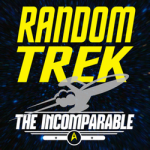 4th season’s Reunion will be up for discussion on the next episode of Random Trek. Qapla’!